Don’t adjust jobs to your vise; adjust your Multi-Vise™ to the job. Multi-Vise adjusts in every direction a job can take you…position it horizontally, vertically, and rotate it 360° in a horizontal plane. Multi-Vise adapts to nearly any job; drilling, filing, stock work, soldering, sanding, and the holding of darn near anything. The highest quality U.S. materials and craftsmanship go into producing the Multi-Vise. The body is constructed of tough, 50,000 psi tensile strength, ductile, iron, which makes it last and last. You won’t have to tighten or loosen extra clamps when you turn Multi-Vise on its side or rotate it back and forth, because the convenient cam locking system automatically locks Multi-Vise in position when you tighten the jaws. Precision-machined, smooth, jaw faces combine firm pressure with a gentle finesse to securely hold metal, wood, or plastic. The 4140, chrome-moly-steel, nickel-plated, rust-resistant lead screw turns effortlessly. SPECS: Cast iron body, precision-machined, green paint. Jaws are 3½" (9.0cm) x 2½" (6.3cm), opens to 5" (12.7cm). 1¾" (4.4cm) square anvil. 18 lb. (8kg) wt. Ikke Juster jobber til din vise; justere din Multi-Vise™ til jobben. Flere skruestikken justerer i alle retninger en jobb kan ta deg... Plasser det horisontalt, loddrett, og rotere 360 ° på et horisontalt plan. Flere skruestikken tilpasser seg nesten alle jobb; boring, innlevering, lager arbeid, lodding, sliping og holde nær darn alt. Høyeste kvalitet amerikanske materialet og håndverk går til å produsere flere Vise. Kroppen er laget av tøff, 50.000 psi strekkstyrke, ductile, jern, noe som gjør det vare og vare. Du trenger ikke å feste eller løsne ekstra klemmer når du slår multi Vise på siden eller rotere det frem og tilbake, fordi praktisk cam påtrykksystemet låser automatisk flere Vise i posisjon når du strammer kjever. Presisjons-maskinert, glatt, kjeven ansikter kombinere fast press med en mild finesse å sikkert holde metall, tre eller plast. 4140, krom-moly stål, forniklet, rust-resistente bly skruen viser uanstrengt. Spesifikasjoner: støpejern kropp, presisjons-maskinert, grønn maling. JAWS er 3½"(9,0 cm) x 2½" (6.3 cm), åpnes 5"(12,7 cm). 1¾"(4.4 cm) kvadrat ambolten. 18 lb (8kg) wt. We have finally learned how to make tools from the Chinese. This vise is a bit crude, no documentation, rough casting, lots of toolmarks on the machined surfaces. If you want to sell an expensive, top of the line vise, get Wilton to make it for you. We'll pay for it. Sending mine back. i started working in a shop that already had this vise installed at my bench. i was very displeased by it from day one, THEN i noticed it was a brownells product...that was very disapointing! its rough, the jaws don't meet up when fully closed, the lock is a total joke, and i've felt smoother at the import stores! and to top it all its 10 times what i paid for the garage sale vise one i have at home that works just fine! NOT up to spec for a brownells product! This product is definanely not up to Brownell's standards. Today my second and replacement vise pulled the threads out of the lead screw nut. The first vise cracked through the moveable jaw. Of course parts are available to repair these issues but the inconvience of not having the vise to use and the expense of replacement parts has me thinking this is the last time I will be going that route. I hate to say it but the import vises built to the same design have held up better in the shop and are a fraction of the price. Brownell's used to sell the Wil-Burt brand vise and I have been using one of them for 40 years, too bad we can;t get tools made like that here in the U.S.A.any more. 1) Knobs roll pinned into handle, NOT threaded. 2) No o-rings installed on handle. 3) 1 set screw to hold lead screw in (do not know what 2nd set screw in parts list is for). Body holes machined eccentrically by a significant amount. Very disappointed. Returned. Would love to know why I received a version so different from video. New Old Stock that was being recycled? Bought a Berry's Mfg Versacradle vice for light work (sold by Brownells) and a Rigid (Pedding-Haus) XF-45 for heavy work. Delighted with Berry's and Rigid. First day of school we were assigned a RED Versa-Vise. At the end of 3 years I bought it from the school and I am still using it. Thought I would try this and wow I had hoped they would be the same, no cigar. It will never be what the real thing is, alas this one is a disappointment. Stunned...at the comparison between these reviews of the current product vs. the (red) one I've been using for over 40 yrs. I also inherited another red one, probably about the same vintage, used heavily by my uncle, a lifelong collector/shooter. Both of these vises are sturdy, well made, and very rugged tools. Not to mention more versatile than any other vise I've ever seen. Both also have a set of pipe jaws that straddle the moveable jaw bar, inside the main jaws. Simple and effective. It's dismaying to read how the mighty have (apparently) fallen. And now I wouldn't sell either of mine for twice the asking price! Long live the - original - Versa Vise! 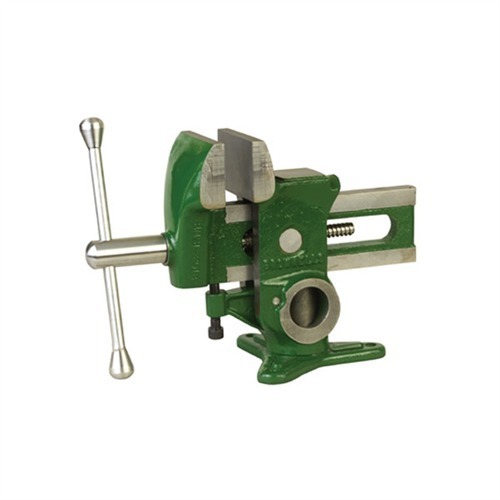 I really wanted to like this vise as it appeared to be an updated version of the original Versa Vise (a long time favorite gunsmith vise), it is made in the USA, and it is green (like my RCBS stuff). Despite the poor reviews, I went ahead and bought two of these vises. The fit and finish of both vises I received was terrible (rough castings). The Chinese versions of this vise style appear better fit and finished. The worst part was that the jaws did not line up on either of the two vises I received. Again, I've seen the Chinese versions line up better. For the price, the quality was unacceptable. Both vises were returned. After reading all of the negative reviews I was a little reticent of purchasing this vise..My instructors used it in class and overwhelming recommended it. Jaws line up perfectly and no rough edges. I use it to fit small extractors as well as drifting sights, of course using pads and a micro fiber to prevent scratches. Really handy to compress mainsprings on struts..It positions to any direction I need, not to mention vertical. If I need to remove a barrel I use my barrel vise. I have my vise mounted to a 3" work table. Use it all day as my strong third hand. Two years now and not the first problem what so ever. The metal in this vise is very soft. Second vise I received is great in every way: good finish, mating surfaces that are flat and square. I use many vises as a tool and die maker. This vise was a no-hassle replacement from Brownells. 2) circular rotational mating surfaces were not flat, but gouged. Recommendation: buy this, but inspect immediately and if you find any flaws, request a replacement. Flaws in a vise are a safety hazard. Also; get both the aluminum/rubber and leather inserts to protect your finished parts from the iron surfaces. I donât normally write reviews but I feel like this vise has been unfairly reviewed on this site. The best way to describe this vise is, buy once cry once. This design works great for gunsmithing but I tried to save a few dollars and bought the same design on Amazon and through another company that bought the original versa-vise design. Both of the other vises broke and were cheaply made with foreign steel. This Brownellâs vise is made in America with American steel. I cannot believe the quality difference between what I had before. I absolutely love this Brownellâs vice. Multi-Vise, Complete 050806102903 Ikke Juster jobber til din vise; justere din Multi-Vise™ til jobben. Flere skruestikken justerer i alle retninger en jobb kan ta deg... Plasser det horisontalt, loddrett, og rotere 360 ° på et horisontalt plan. Flere skruestikken tilpasser seg nesten alle jobb; boring, innlevering, lager arbeid, lodding, sliping og holde nær darn alt. Høyeste kvalitet amerikanske materialet og håndverk går til å produsere flere Vise. Kroppen er laget av tøff, 50.000 psi strekkstyrke, ductile, jern, noe som gjør det vare og vare. Du trenger ikke å feste eller løsne ekstra klemmer når du slår multi Vise på siden eller rotere det frem og tilbake, fordi praktisk cam påtrykksystemet låser automatisk flere Vise i posisjon når du strammer kjever. Presisjons-maskinert, glatt, kjeven ansikter kombinere fast press med en mild finesse å sikkert holde metall, tre eller plast. 4140, krom-moly stål, forniklet, rust-resistente bly skruen viser uanstrengt. Multi-Vise, Handle w/knobs Ikke Juster jobber til din vise; justere din Multi-Vise™ til jobben. Flere skruestikken justerer i alle retninger en jobb kan ta deg... Plasser det horisontalt, loddrett, og rotere 360 ° på et horisontalt plan. Flere skruestikken tilpasser seg nesten alle jobb; boring, innlevering, lager arbeid, lodding, sliping og holde nær darn alt. Høyeste kvalitet amerikanske materialet og håndverk går til å produsere flere Vise. Kroppen er laget av tøff, 50.000 psi strekkstyrke, ductile, jern, noe som gjør det vare og vare. Du trenger ikke å feste eller løsne ekstra klemmer når du slår multi Vise på siden eller rotere det frem og tilbake, fordi praktisk cam påtrykksystemet låser automatisk flere Vise i posisjon når du strammer kjever. Presisjons-maskinert, glatt, kjeven ansikter kombinere fast press med en mild finesse å sikkert holde metall, tre eller plast. 4140, krom-moly stål, forniklet, rust-resistente bly skruen viser uanstrengt. Produsentnr. : 2016 Ikke Juster jobber til din vise; justere din Multi-Vise™ til jobben. Flere skruestikken justerer i alle retninger en jobb kan ta deg... Plasser det horisontalt, loddrett, og rotere 360 ° på et horisontalt plan. Flere skruestikken tilpasser seg nesten alle jobb; boring, innlevering, lager arbeid, lodding, sliping og holde nær darn alt. Høyeste kvalitet amerikanske materialet og håndverk går til å produsere flere Vise. Kroppen er laget av tøff, 50.000 psi strekkstyrke, ductile, jern, noe som gjør det vare og vare. Du trenger ikke å feste eller løsne ekstra klemmer når du slår multi Vise på siden eller rotere det frem og tilbake, fordi praktisk cam påtrykksystemet låser automatisk flere Vise i posisjon når du strammer kjever. Presisjons-maskinert, glatt, kjeven ansikter kombinere fast press med en mild finesse å sikkert holde metall, tre eller plast. 4140, krom-moly stål, forniklet, rust-resistente bly skruen viser uanstrengt.